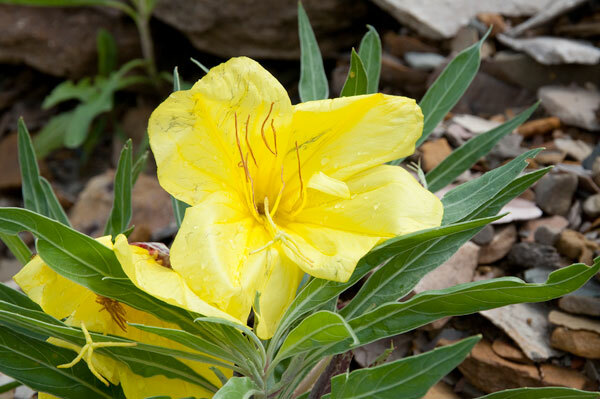 The Missouri Evening Primrose (Oenthera macrocarpa) is my current favorite wildflower, partly because the blossoms are large, showy, and just plain beautiful. The other reason is I’m just excited about finding a nice sized plot of these primroses and having the opportunity to snap a few photos there. Plus I was able to purchase a couple of plants from a local nursery this spring, so in future years I can enjoy Missouri Evening Primroses in bloom without leaving home. I found these particular primroses blooming among the rocks on a hillside cut-out next to the highway. I’ve actually been aware of this patch for a few years but this is the first I’ve managed to be going through under the right conditions, i.e. the plants were blooming, I had time to stop, and traffic conditions were light enough that I could safely pull over and park nearby. 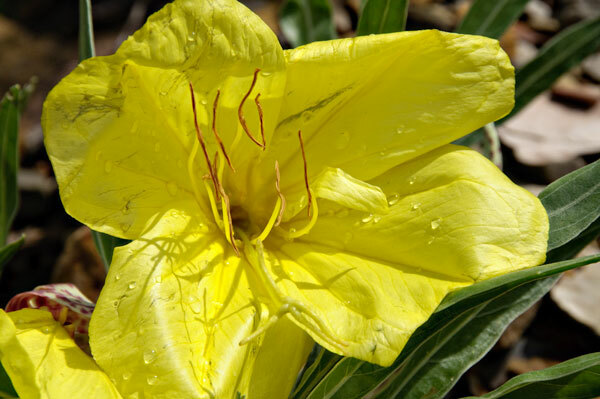 The flowers are large, four to five inches across. Each lasts only a single day, opening in the afternoon and closing the next morning. I’ve read that they have a mild, pleasant fragrance but have yet to observe that because the wind always seems to be blowing hard on the days I’ve been close to Missouri Evening Primroses in bloom. You can see the bruising on the petals in the photo above from the wind whipping them about. Strong storms had passed through the area in early morning hours, and the rest of the day brought more wind and scattered showers. It was a tough day to be a flower. There’s quite a thriving community of Missouri Evening Primrose at this particular spot, but only one had burst into bloom yet. Each plant had at least a half dozen buds, hidden among the foliage. Around here, they bloom for just a short period in May and sometimes into June. Across their range — Nebraska, Kansas, Missouri, Oklahoma, Texas and Arkansas — the bloom span can range from May to August. 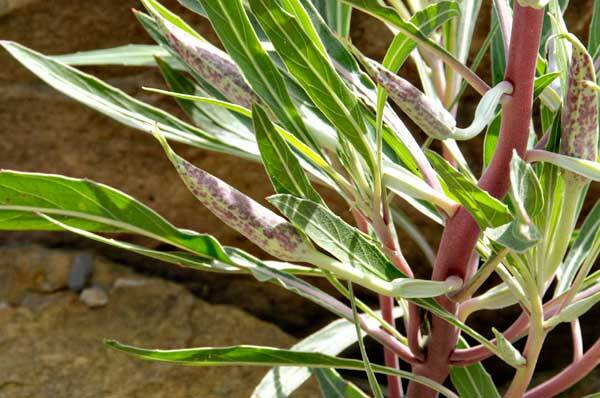 The buds aren’t hard to spot once you know what to look for — they’re the pink speckled bits protruding from those pink tinted stems. Above: a closer look at the buds. 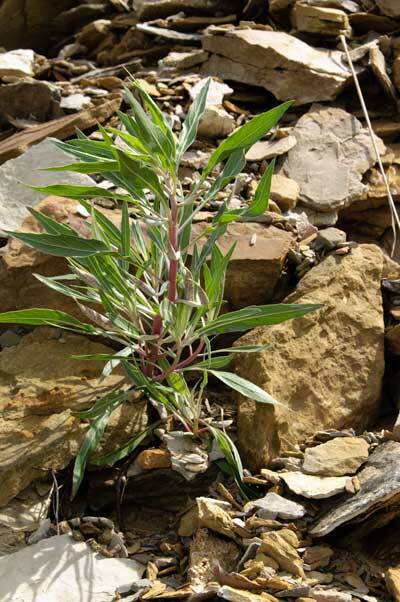 The plants are best started from seed or purchased from a nursery. You may see the seed listed on some sites with the old version of it’s latin name, Oetheria missouriensis. That was changed recently by botanists to Oethera macrocarpa. Efforts at dividing and relocating plants from native stands generally aren’t too successful due to the large tap root that doesn’t adapt well to that much disturbance. That tap root, incidentally, has been mentioned in literature as having been eaten by native tribes. That’s just hearsay, though. I haven’t tracked that rumor down to a reliable source yet, though I’ll let you know if I and when I do find documentation. 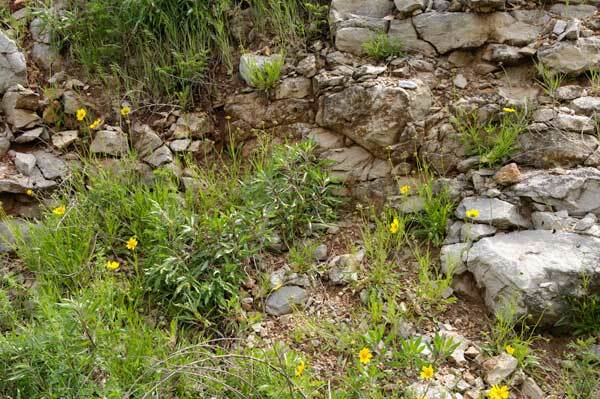 The plants blend into the rocky hillside, hiding among the clusters of blooming coreopsis. Again, once you know what to look for, they’re not difficult to spot with their wider, bushy forms and deep pink tinted stems. Of course, once the blossoms open, those two large bunches in the center of the photo above won’t blend in at all. Those big yellow primrose flowers tend to attract a lot more attention than their smaller coreopsis neighbors.